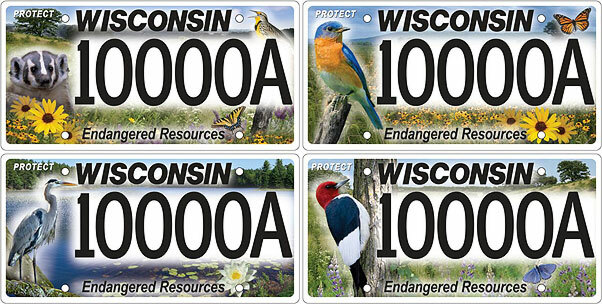 Wisconsin will soon have a new license plate benefiting the state’s endangered resources. And, Department of Natural Resources spokesman Bob Manwell says, you can help choose the new design. The gray wolf has been featured on the Endangered Resources plate since 1995. Manwell says new flat-plate digital printing technology allows for more colorful and detailed license plates. The DNR hopes a new design will generate more interest in the program and help to revive declining sales of the plates, whose $25 annual fee supports the Endangered Resources conservation fund. Surveys show nearly half of Wisconsin adults are bird watchers. So Manwell says birds are an easy choice for the new plates, which represent much more than just endangered wolves. The proposed plates also feature Wisconsin’s landscapes and precious wildlife habitats. The options were designed and donated by Nancy Rudd of Rudd Designs in New Glarus. The $5 million program not only protects animals, but also native plants and natural communities critical to all species.